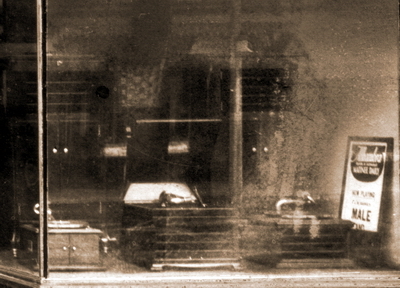 This unlabelled "mint" postcard of a phonograph store in Toronto led the authors Arthur Zimmerman and Betty Pratt on a remarkable research quest to find out everything that could be discovered about the store, the proprietors, the merchandise they sold and the fate of the business and of its owners. They even managed to date the photograph to within one week! This story is about the fun that we had in asking and in trying to answer questions about a photograph of an unidentified phonograph / gramophone wholesale and retail store, and about the information about the industry and the people in and around it that can fall out of such a study. We are still amazed by what this photograph has told us. Betty and Bill Pratt are always on the lookout for pictures, handbills and documents of Canadian piano and phonograph / gramophone factories and stores. Betty found our cover photograph at a card show a few years ago. There was nothing useful printed or written on the back of this Real Photo postcard, the only clue to location being street number 499 on the front door. No street, no city and no date. One day, walking along Bloor Street just west of Brunswick, Toronto, Betty recognized the facade from the bevelled glasswork frieze pattern above the storefront and the street number matched. 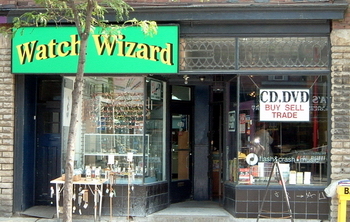 Upon comparison with the postcard, 499 Bloor Street West was the store in the photograph! This store at the western end of the 8-section Gallanough Block was where Standfield-Macpherson Company (S-M), the Starr Phonograph and bulb dealer, had been. The Pratts then went to Might’s Toronto City Directory and found that the Standfield- Macpherson store was there around 1920. 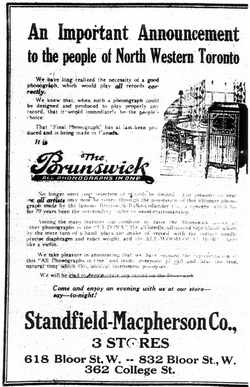 Starr advertisement for S-M at 499 Bloor Street West (TDS Nov. 22, 1919, p. 14). Note the telephone number, College 5626, which the business retained throughout its existence. Who were Standfield and Macpherson, how did they come to be Starr dealers and what became of the business? Once we began the search, answers tumbled out very quickly. We went back to Might’s Directory and to the City of Toronto Assessment Rolls (CTAR) to check out the time-line and management, to the Canadian Music Trades Journal (CMTJ) and to The Toronto Daily Star (TDS) and Globe (G) databases for backgrounding, advertisements and personal data. There is a small sign at the far right in the right-hand window, at a bad angle against the outside wall. 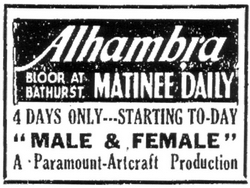 We struggled with the parallax problem and, after much effort understood that the film "Male and Female" was playing at the Alhambra Theatre, Bloor and Bathurst Streets. That was a Cecil B. de Mille film, released in late 1919. It played at the Alhambra on March 1-4, 1920 (TDS Feb. 28, 1920, p. 7), though it may have returned later, so the photo could have been taken in that first week of March, 1920. The store sign was made by The Macey Sign Company, which still exists as Macey Neon, a trade name of Sicon Sign (652013 BC Ltd.) of Vancouver. The original contract is lost. The owners of the business were Melville Edgar Standfield and Archibald Harold Macpherson. We derived a great deal of personal information about them, their work and family histories from Might’s Directories, CTAR and the newspaper databases. In the current telephone book, we found and called the only Standfield in Toronto. With their kind assistance, we have now talked and corresponded with three members of the Standfield family, in Lachine and in Vancouver. Finding Macpherson’s descendants was far more difficult. We followed several leads, contacted Clan Macpherson, and finally paid for a severely edited copy of the death certificate through FIPPO, from which we found the obituary notice (ET April 5, 1961, p. 40), the will (AO RG 22-356, #1431 Grey Co., Grant #149, May 31, 1961) and the name of his nephew, Stuart Crawford Williams. We then visited the family plot in the cemetery, got the nephew’s vital dates, and it was his obituary (KWS April 16, 2004, p. 33) that led us to the surviving branch of the family. There is a family memory of Macpherson’s being in the phonograph business, but no memory of the Standfield partnership. Company president Melville Edgar Standfield (London, Ont., Sept. 1, 1870 – Toronto, March 12, 1922) was descended from Thomas Standfield, one of the Tolpuddle Martyrs of Dorset, England (DT July 2, 1997) who settled in London, Ontario, in 1844. Melville came to Toronto in 1906, worked as an accountant and traveller for some office supply companies (Copeland-Chatterson Co. Ltd. in 1907-08, and Canada Stationary Co. in 1909), then as Standfield & Hudson "systems experts" in 1910. After the death of his wife, Amy Holmes (1868-1910), Melville went out on his own as a business expert. In 1915, he was listed in Might’s as secretary of Commercial Account Registers, Ltd., office supplies, and also as M.E. Standfield & Co. He had two children, Mary Kathleen "Kitt" (married Hugh Miller; TDS Aug. 29, 1921, p. 10) and Reginald Edward Holmes (who married Hugh Miller’s sister; see below). Melville turned up as a very successful travelling wholesaler for the Canadian Phonograph Supply Co., London, in the last months of 1917 (CMTJ Dec. 1917, p. 63; TMW Jan. 15, 1918, p. 41). This company, begun in April 1917 by John A. Croden and W.D. Stevenson of London, was the exclusive Canadian distributor for Starr phonographs and records of Richmond, Indiana (CMTJ April 1917, p. 59). Perhaps Melville’s family connection with London had something to do with his association with the company, but we cannot yet prove it. A few months later Melville was put in charge of the Toronto branch stocking samples, possibly a wholesale showroom, in addition to his Ontario territories (CMTJ Feb. 1918, p. 73). By the end of the year, he was out west for the company (CMTJ Nov. 1918, p. 71), now the Starr Company of Canada (CMTJ April 1918, p. 81). 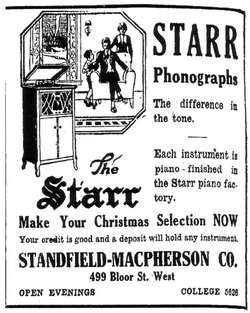 Perhaps Standfield-Macpherson Company was a product of Starr’s aggressive campaign in 1919 to recruit new dealers and to promote its new lateral-cut Gennett records. At the time of his premature death from heart disease on March 12, 1922 (ET Mar. 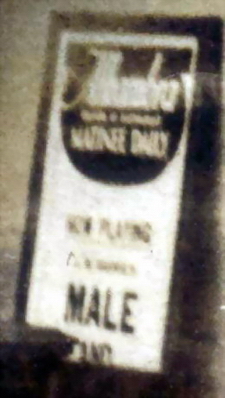 13, 1922, p. 19; TDS Mar. 13, 1922, p. 12; G Mar. 13, 1922, pp. 1 & 11), as well as president of Standfield-Macpherson (S-M), Melville was president of the Phonograph Dealers Association, Honorary President of the Bloor-Bathurst Business Men’s Association (he was known as the Mayor of Bloor Street), President of the Federation of Business Men’s Associations, a member of the Town Planning Commission and a member of the Board of Control subcommittee to investigate Toronto’s street lighting system. He was remembered as "a man of forceful personality and a natural leader of men" (G ibid.). Melville’s business partner and vice-president / secretary-treasurer, Archibald Harold Macpherson, was born to wholesale fruit dealer Alexander Crawford (c. 1857-1917) and Phoebe Ann Macpherson of Winnipeg, February 14, 1892, and from around 1906 lived mostly at 182 Jameson Avenue in the Parkdale district of Toronto. He went to Queen Victoria Public School, at King and Close, and attended Jameson Avenue Collegiate (called Parkdale Collegiate after 1910) in 1907-08. Then he worked as a clerk for Canadian Cereal & Milling (1911), Bell Telephone (1912), Macpherson Realty Company (1913), Toronto Hydro (1915) and for the C.N.R. in 1919 before he joined S-M. 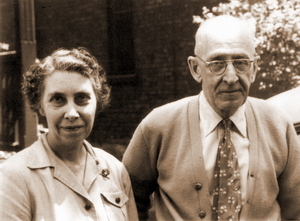 He married Oreta "Reta" Gertrude Call (1892-1957) of Indiana, but they had no children. We found Grace Williams, the widow of his sister Gladys’s son Stuart Crawford Williams, in Eastern Ontario. She knew him as Harold and described him as very quiet and kind, but a man who didn’t talk much and kept to himself a lot. The family believes that Harold invested his inheritance in Standfield-Macpherson. Their salesman was Melville’s son Reginald Edward Holmes Standfield (London, Ont., July 27, 1895 [UT], or July 15, 1896 [personal communication from Barry Standfield] – Vancouver, July 15, 1950), also raised in Parkdale. After Queen Victoria Public and Jameson Avenue Collegiate, 1908-12, Reginald registered in Arts at Victoria College, University of Toronto. His student transcript does not continue beyond the 1912-13 session (UT), though he is supposed to have played rugby for the university team (CMTJ April 1924, p. 78). He worked as a clerk for Temple-Pattison & Co., dental supplies, circa 1916-17, and for Claudius Ash, Son & Co., dental supplies, circa 1918. According to the family, he volunteered for WW I in late 1914 or early 1915, was sent to Texas for training, then posted to England where he was commissioned as a flight instructor in the Royal Flying Corps. He did not go into action in WW I. The family recalls that he belonged to the Parkdale Canoe Club, was athletic and strong and played a total of three games on the back line for the Toronto Argonaut Football Club in 1915 and 1920. It’s not clear whether for the Big 4 or Argos II (CMTJ ibid. ; G Nov. 8, 1915, p. 11). He had a good baritone voice and studied singing with Mr. W.G. Armstrong at the Canadian Academy of Music on Spadina. He sang with the Savoyard Opera Company, was a leading man with the Parkdale Canoe Club Musical Comedy Company in its week at the Royal Alexandra Theatre, 1921 and 1922 (CMTJ ibid. ), and we found Reginald singing a little recital over CFCA, the Toronto Star radio station (TDS Aug. 28, 1922, p. 10). Our photograph shows that S-M was a wholesale and retail dealer in Starr Phonographs, and wholesaler of tungsten and nitrogen lamps. The Starr Company of Canada, London, Ontario, distributed and manufactured machines and records for the Starr Phonograph Company of Richmond, Indiana. Nitrogen- filled lamps were new and were supposed to be exceptionally strong and bright, for stores, garages, offices and factories (TDS Nov. 5, 1918, p. 23). The business partnership was declared on October 2, 1919 to "....carry on....business as wholesale and retail electric lamps, phonograph records at Toronto in partnership under the name Standfield Macpherson.... said partnership has subsisted since 31st March 1919" (AO Companies Branch records 8667 CP, reel MS 2054). We did not find a record of how these two gentlemen met and decided upon the business partnership. 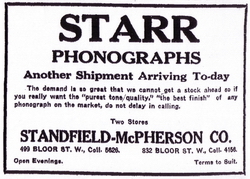 The phonograph store at 499 Bloor Street West first appeared in CTAR on August 25, 1919 – it was listed as a cigar store a year before – and Standfield-Macpherson was mentioned as representing the local Starr dealers at the company exhibit at the 1919 Canadian National Exhibition (CMTJ Sept. 1919, p. 76). S-M ran Starr ads that November (TDS Nov. 19, 1919, p. 10; TDS Nov. 22, 1919, p. 14) and on November 29 introduced its second store, at 832 Bloor West (TDS Nov. 29, 1919, p. 12). One of the S-M advertisements for the "high grade" Challenge Phonograph, obtained to fill demand when Starr could not supply certain machines for the 1919 Christmas trade (TDS Dec. 18, 1919, p. 12; TDS Dec. 20, 1919, p. 10) Does anyone know who manufactured and/or supplied the Challenge Phonograph? Just before Christmas, when many Starr machines were unavailable, S-M ads featured only the doublespring Challenge Phonograph, which had a universal tone arm, and could be delivered that same night for $5 down and $2 weekly (TDS Dec. 18, 1919, p. 12; TDS Dec. 20, 1919, p.10). S-M was still listed as a Starr dealer in late June (G June 23, 1920, p. 7), but 499 Bloor West was in the process of becoming the "The Bloor Street Brunswick Shop" (TDS June 3, 1920, p. 24), with no mention of S-M or the second store. As of August 25, 1920, CTAR no longer listed S-M at 499 Bloor, but showed The Brunswick Shop there, under different management. Charles S. Porter, who had run a phonograph dealership at 1631 Dundas West in 1919, was now dealing in phonographs at the old 499 Bloor store (Might’s 1921). The 1920 Might’s Directory (compiled in late 1919), showed S-M with three stores, at 499 Bloor West, 832 Bloor West and 362 College Street. A year before, 832 Bloor had been apartments and then a shoe store, and 362 College dealt in preserves. As noted above, by August, 1920, S-M had left the original store at 499 Bloor. 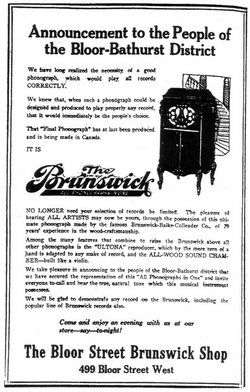 Then, in December, an announcement, almost identical to that of June 3, that S-M was now a Brunswick dealer at its three stores, 618 and 832 Bloor and 362 College (ET Dec. 9, 1920, p. 20). Months later, they were still Brunswick dealers at the same three stores (TDS May 6, 1921, p. 30). 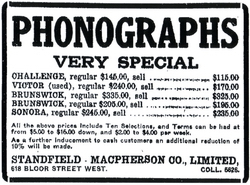 In the 1921 Might’s, S-M was listed at 618 Bloor West (a former butcher shop) and at 832 Bloor West, now selling "musical instruments" (a general term which may have included phonographs), but soon were reduced to 618 Bloor West, offering a special on Challenge, Brunswick, Sonora and a used Victor (TDS Nov. 4, 1921, p. 2). Perhaps the continent-wide economic downturn of 1921-23 reduced their fortunes and the number of their business outlets. All the while, however, though not listed as dealers in Starr advertisements, 618 Bloor West remained in the Bell Telephone directories as “Starr Phonograph Parlors” (Jan., May, Nov. 1921, May, Nov. 1922). Later they were selling "musical instruments" (CTAR August 15, 1922). We surmise that Melville lost his Starr showroom by late 1919, when the Starr Special Distributing Branch under Mr. E.W. Wood turned up in room 412 in the Ryrie Building, 229 Yonge, corner of Shuter (CMTJ Dec. 1919, p. 60). A year later, the Branch was in the Hiscott Building at 61 College Street, under John Caswell, but the following year it was at 618 Bloor Street West (G Oct. 17, 1921, p. 3). At 618 Bloor, S-M stocked the entire Starr catalogue, though they were never listed as agents in Starr ads. Although we found no explicit indication that the Starr Branch was being run by S-M, they were the only tenants of 618 Bloor West (CTAR Aug, 15, 1922; Aug 17, 1923) and the two businesses shared the original S-M telephone number, College 5626. Following the disastrous fire at the Starr warehouse in London (G Apr. 29, 1922, p. 16), Starr sold off its phonograph stock (TDS May 19, 1922, p. 12) and wound down its operation. 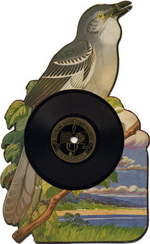 S-M’s business was likely on the downturn then too, especially when Reg was lured away to Uxbridge by Gold Medal Radio-Phonograph Corporation, Ltd. S-M was out of the music business by the summer of 1923. The Burrows Music Shoppe (Louis J. Burrows, a former Willis Piano agent and later Starr dealer at 920 Queen East) first appeared in CTAR at 618 Bloor West on August 17, 1923. The 1924 and 1925 Might’s have the Burrows Music Shoppe at 618 Bloor, with the Starr Company of Canada, Ltd., managed by William A. Dietrich, in the rear, both dealing in "musical instruments". We do not know whether these were independent businesses – there is still a major entrance door at the rear of 618 Bloor – and whether this incarnation of the Starr Company dealt in records, or perhaps in Starr pianos as well. According to the 1922 Might’s, Harry C. Slater had taken over from Charles S. Porter as phonograph dealer at 499 Bloor, Mrs. Maud Kennedy was handling musical instruments at 832 Bloor and the Central Victrola Parlors was at 362 College. It is intriguing that each of the four S-M stores remained phonograph / gramophone shops, under new management, after Messrs. Standfield and Macpherson moved on. In 1923, 499 Bloor was a hardware / electrical store and in 1924 it was vacant. In 1926, both Burrows and Starr of Canada were gone from 618 Bloor. From 1919 to 1921, Melville was president of S-M (ET Mar. 13, 1922, p. 19), Macpherson the vice-president and Reginald the salesman. Note that the company name is found variously hyphenated, unhyphenated and using an ampersand between the names. 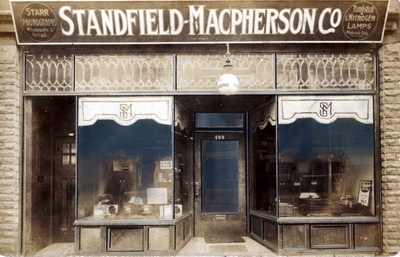 The company applied for a charter of incorporation or Letters Patent under the Ontario Companies Act on April 13, 1921, to take over the business of Standfield Macpherson Company as Standfield-Macpherson Company, Limited, with a capital stock of $40,000, comprising 400 shares valued at $100 each. The provisional directors were their lawyers Leopold Macaulay, William Thomas Sinclair and Hugh Johnston McLaughlin of McLaughlin, Johnston, Moorhead and Macaulay, 120 Bay Street. S-M was going to carry on "....business.... as wholesale and retail dealers in musical instruments, musical compositions and records" (CB #19074; file 29-20-3-1). Macpherson was to be president and Melville Standfield the secretary-treasurer. No explanation was given for the exchange of executive officers, nor for dropping the term “phonographs” and the lightbulb business, though they were still Brunswick phonograph dealers at three stores (TDS May 6, 1921, p. 30). In the company’s Statement or Return of Affairs, as of December 21, 1921, Macpherson was president and manager, Leopold Macaulay was vice-president, Melville was secretary-treasurer, the directors were Reginald Standfield and Oreta G. Macpherson, and the address was 618 Bloor West. 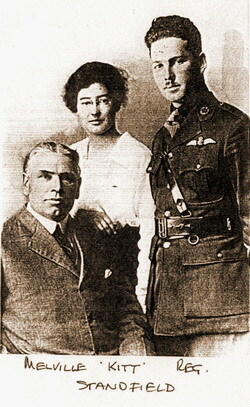 In the next statement, dated February 20, 1923, Macpherson was president and manager, Macaulay was vice-president and Reginald Standfield had replaced his late father as secretary-treasurer. The directors were now Mrs. K(athleen) Miller and Oreta G. Macpherson. The Standfield family says that the business was wound down, but the story retained by the Macpherson family is that they went broke. The Companies Branch was informed by Mr. Leopold Macaulay in 1930 that the S-M Company last operated in 1923, that Mr. (Melville) Standfield was dead and that the charter could not be found (CB letter of August 16, 1930). At this point, neither Macpherson nor Reginald Standfield could be located by anyone. Thirty years later, by an order dated November 7, 1960, the Provincial Secretary cancelled the Letters Patent "for default in filing Annual Returns and declared said corporation to be dissolved on December 12, 1960". The total fees owed from 1923 to 1960 were $152.00 (CB #19074, file 29-20-3-1; AO MS 508 reel 3). The Macpherson family apparently left Toronto and rented out the family’s home on Jameson Avenue in 1924, soon after S-M disappeared, but Archibald Harold returned in 1930 and continued to live there in one of three "suites" with his wife, Oreta, until the middle 1950s. After brief ventures in real estate and the cleaning and dyeing business, he became a clerk in the City Department of Public Welfare around 1935, was last listed in Might’s in 1960, still holding that job, but living at 40 Avenue Road. His wife Oreta died on May 3, 1957, and the family told us that he retired and moved to Meaford to live with his sister Gladys in May, 1960. Macpherson died in Meaford, Ontario, on April 4, 1961 (ET April 5, 1961, p. 40; ME Apr. 6, 1961, p. 1; FIPPO) and is buried with his wife, siblings and parents at Mount Pleasant. Reginald Standfield gave up the family’s apartment at 310 Brunswick Avenue to live with his married sister "Kitt" Miller at 38 Howland Avenue by late 1922. Soon after, he was at 3 Palmerston Gardens, directly north of the 618 Bloor store. It’s possible that Standfield-Macpherson was disbanded in 1923 when Reginald received an offer from the McMurtry family that he couldn’t refuse, to become factory manager of their new Gold Medal Radio-Phonograph Corporation, Ltd., in Uxbridge, Ontario. There, he supervised a staff of some 35 workers and was well liked as the boss. "Despite Reg’s carefree look, he has been a real 'plugger' ....having worked from the ground up in the Gold Medal plant, mastering as he went along many difficult and technical courses in wood drying, glue practice, finishing, etc. The Gold Medal state they owe much to Reg for their present high standard of finishing...." (CMTJ April 1924, p. 78). The Standfield family retains a story of the Uxbridge factory’s water tower being out of order and Reg asking for a volunteer to climb up to fix it. No one came forward, so Reg himself climbed up the ladderless tower by means of the cross-braces, and fixed it himself. He had to, because he could not back away from it. Reg "successfully improved the profits of Gold Medal over a period of a couple of years" (personal communication, Gary Standfield). 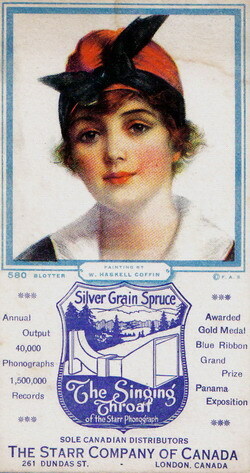 Reg married his sister-in-law, Miss Dorothy Hill Miller of 33 Wells Street, Toronto (TDS Aug. 18, 1924, p. 19), and then was lured away from Gold Medal to head the radio department at the Robert Simpson Company in Toronto. He moved to Vancouver in 1926 to become manager of the radio department at the Hudson’s Bay Company, was appointed assistant manager of the Winnipeg Bay store in 1932, then of the Calgary store and from 1936 or 1937 was manager of the Vancouver store. In Vancouver, he was the first B.C. chairman and a national director of the Air Cadet League of Canada, a member of the council of the Vancouver Board of Trade, a member of the Vancouver Club, the Royal Vancouver Yacht Club, the Vancouver Gun Club and the Air Force Officers’ Association. He died in Vancouver in 1950 (G July 17, 1950, p. 11; VS July 17, 1950, p. 1), survived by his widow and two sons, Barry and Derek. The store at 499 Bloor Street West looks surprisingly like it did in March 1920. The glass frieze is intact above the front windows, which look the same as well. The threshold of little hexagonal marble tiles, with "499" and a border inlaid in blue, is still there, and the pressed-tin ceiling is still in place in the westerly half. The door to the upstairs apartments, at left, looks as it did in the photograph. The major change is that the central front door has been replaced by two doors, almost at right angles to each other, each giving entrance to a separate store. 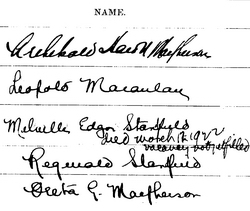 We do not know how the 49 year-old Melville Standfield and the 27 year-old A. Harold Macpherson got together to open a phonograph / gramophone business in mid-town Toronto, circa 1919. Perhaps young Reginald and young Harold knew each other from public or high school, from the Parkdale Canoe Club, from the Argonaut Rowing Club, from its football team or from its musical activities. We do not yet know why S-M originally chose to combine the phonograph and wholesale light bulb businesses. We have no evidence for why S-M expanded quickly, apparently collapsed just as quickly – perhaps it was a victim of the explosive advent of radio in 1922 and/or the depression of 1921 - 1923. S-M seems to have switched its speciality to "musical instruments", but gramophone / phonograph stores were listed in Might’s under "Musical Instruments", so S-M might have remained in the machine business at the last store, at 618 Bloor West. From the ensuing rapid changes in ownership at the various former S-M stores, the phonograph competition must have been cut-throat, or the locations could have been poor. Detail of S-M store window, left side. Arrows indicate Talking Books "The Battle of the Marne", "The Mocking Bird" and "I am a Lion", and what may be a Talking Book catalogue at lower right. All this information came to light from one fine but uncredited and undated photograph. We hope that this story illustrates what can be discovered about almost anything, if one knows where to find the search tools. 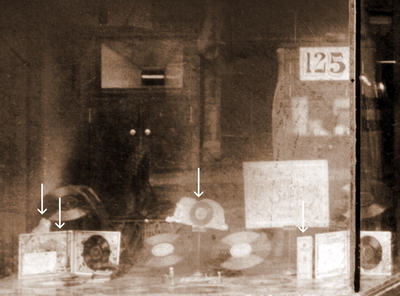 In the left-hand window, we see what looks like a Canadian Starr Model III machine at rear left, with its lyre grille removed and on the floor in front, and an unknown machine to the right, with a sign reading "125". 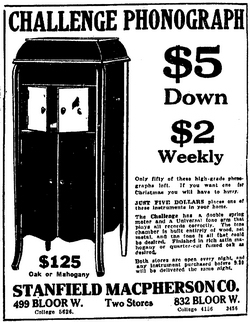 Perhaps this is the $125 Challenge Phonograph, as shown in the newspaper advertisement (TDS Dec. 18, 1919, p. 12; TDS Dec. 20, 1919, p. 10). The large sign below reads in part "....Favorite selection....". 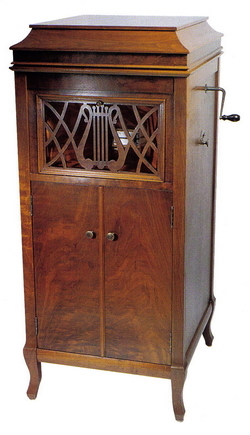 The right-hand window contains Victor machines only, a Victrola VV-IV at lower left, a IX with open lid in the centre and a VI at right. In the rear are two Victrola 14 uprights. The identifiable records in the left-hand window are almost all from the two "Talking Book" series produced for children by the Emerson Phonograph Company, Inc., through Talking Book Corporation in New York and Talking Book Company, Ltd., in Toronto. They issued multi-page gatefold books, with one or two celluloid records glued inside, that could be flipped open to lie flat and be placed directly onto a turntable. The other type was a die-cut, laminated cardboard tablet, a "talking doll" or "talking animal", with a celluloid record glued or riveted onto one side and a related poem or story printed on the reverse. That too was placed directly onto the turntable for tracking. Detail of S-M store window, right side. 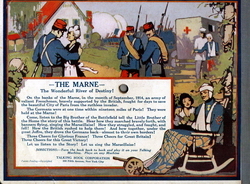 At far lower left is the gatefold "The Battle of the Marne" and the top of the laminated die-cut "Mocking Bird" can be seen above and behind it. Mounted on a pedestal at centre is a light blob with a disc record in its centre, and this is the "I Am a Lion" "talking animal". David Lennick can identify a real U.S. Gennett disc immediately above "The Battle of the Marne" book (personal communication). Other records, mounted like cymbals on short poles, cannot be identified for certain nor can the several records visible on the floor of that window. We believe that the 10 inch-tall sheet standing just to the left of the unidentifiable gatefold at far lower right, may be a rare "Talking Book" catalogue. Thanks to Gary Standfield, Lachine, Dr. Hugh Standfield Miller, Vancouver, Barry and Derek Standfield, Vancouver, Mrs. Grace Williams of Kingston, Mrs. Glenna Voorneveld of Brockville, Mrs. Kathryn Spencer-Lee of Belleville, David Lennick of CAPS, Andrew McMurtry of CAPS, Jan Verboom of Pickering, George McCauley of the Argonaut Rowing Club, Mr. John Maize of Parkdale Collegiate, Sally Gibson and Elizabeth Cuthbertson of Metro Toronto Archives, Maria Kouroupis of Sicon Sign of Vancouver, Scott Woodhouse, Editor of the Meaford Express, the Royal Conservatory of Music, and Bill Pratt of CAPS for technical help and advice. Special thanks to Peter Muldavin, whose book "The Complete Guide to Vintage Children’s Records" will be published in December.